Is this really August? I love working outside during the day and raising windows at night to the chorus of tree frogs and jar flies. I don’t recall this time of year ever being so cool and breezy. I do recall, however, the oppressive heat of late summer– other times, other places. I remember Venice…on a hot August night. Music was playing in the distance, drifting across the water. A floating band had gathered somewhere on the Grand Canal for an evening performance, and we slipped into the closest gondola and headed off for a romantic evening beneath a starry Venetian sky. We were twenty-somethings; the world still felt new. At first we thought the gondolier was just an unusually happy fellow, but we soon realized this was not the case. He was drunk. He danced in place and played with the oar. He rocked the boat, tipping it way too far from side to side. I looked up at the dark sky, down at the dark water. I couldn’t swim. I grew up in the hills of Kentucky and the few times I had gone to a swimming pool I’d stayed in the shallow end where I could keep my feet on solid ground. At the river I played near the bank. At the lake with friends I lathered my arms and legs with quick tanning lotion and stretched out in the sun. I didn’t do water. A few years later, when I was working at a university in Washington, D.C., I would take swim lessons for the first time and finally hold my head under water without panicking. But that night in Venice the frightening vision of falling overboard wouldn’t stop playing in my mind. The floating concert was crowded. Lots of gondolas squeezed in around a larger boatload of musicians. We were happy to take a “seat” in the back, but our gondolier insisted on getting us to the front row. I braced myself by holding on to both sides of the boat. At least there were hordes of people around to help if we turned over. We didn’t. The gondolier called out to his “amici,” who didn’t look pleased at all but probably didn’t want a scene, and they allowed him to shove our boat between the smallest spaces, banging against one gondola after another as he bullied his way through the crowd. When we got to the front I looked around at the other faces and felt embarrassed. I wanted to enjoy the music and the picture-perfect setting, but I was not happy until the last note was played and I could step out of that boat onto solid ground. It was late when I opened the thick wooden shutters in our hotel room and sat in the window. Boats still passed in the canal below with their oars swishing through the water and people laughing, enjoying their special moments beneath a sky full of stars. Violins played softly in the distance. I finally had the perfect seat. I have four things from Venice — an album of faded photographs (remember the Instamatic? 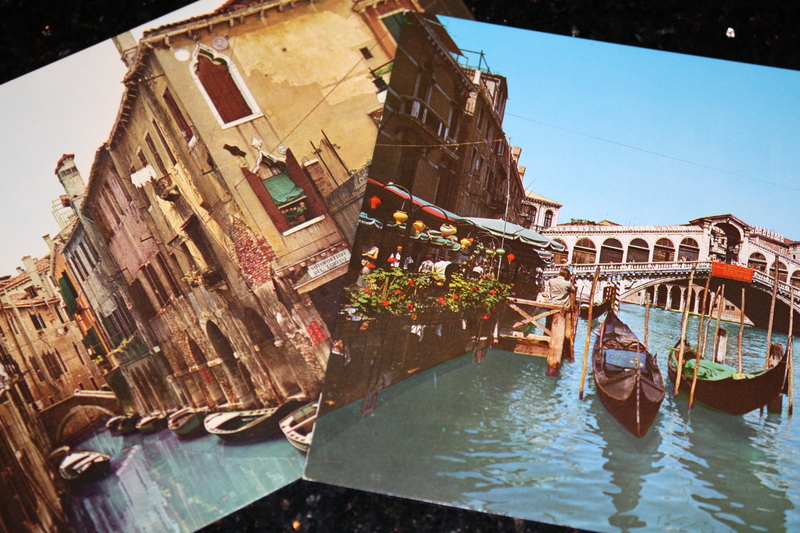 ), a stack of pretty postcards, a Venetian glass necklace, and a whole bunch of memories. What else could anyone need? « Reading the fine print — or not!